Keeping an eye on the Sun - so you don't have to! The Sunspot Astronomy & Visitors Center is open daily 9 a.m. to 5 p.m. from March 1st through October 31st. During the months of November through February, the Visitors Center will close at 4:00pm. Guided tours start at 2pm each day in the summer. All guided tours are subject to cancellation in the event of inclement weather. To arrange a guided tour for a large group, please call the Visitor Center at 575-434-7190. The Dunn Solar Telescope is the last operational telescope on the site. When in use, the telescope is open to visitors, and visitors are welcome to see the observing room. The telescope does not necessarily adhere to a strict schedule, but typically will be operation early weekday mornings through mid-afternoon. Currently, the telescope is closed to the general public on weekends, due to limited staff availability. Please check with the attendant at the Visitors Center to see if the telescope is open to visitors. While driving through the town of Cloudcroft, and along NM Route 6563, you may have noticed blue highways signs bearing the names of the planets. Those are our scale model of the solar system. 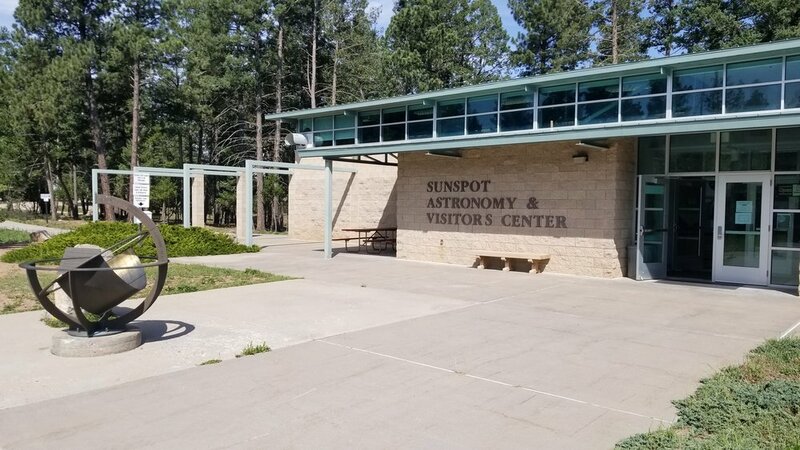 The concept is similar to a map - the distance from downtown Cloudcroft to the Visitors Center in Sunspot is scaled to correspond to the distance between the Sun and the dwarf planet Pluto. The other planets are placed along that route to scale with their distance from the Sun. Look for them all as you make your way to Sunspot! It may surprise you just how close the Earth is to the Sun on this scale! Given that it takes approximately 8 minutes, 20 seconds for light from the Sun to travel to Earth, the speed of light on this scale is only 3.24 mph, or about 4.75 feet per second. Driving at 35 mph on NM Route 6563, to scale, you are moving approximately ten times faster than the speed of light - Space is Big! Sunspot Solar Observatory is a remote location at a high altitude. There is no food available on site, and the only water on site is available from fountains in the Visitors Center. NOTE: If you are following directions from google maps, apple maps, gps, etc., it will tell you to turn right from US 82 onto Karr Canyon Road - DO NOT DO THIS. Karr Canyon road is an unmaintained, and sometimes impassable (due to fallen trees) dirt road. You SHOULD NOT drive on dirt to reach our site. There is a paved road the ENTIRE WAY.